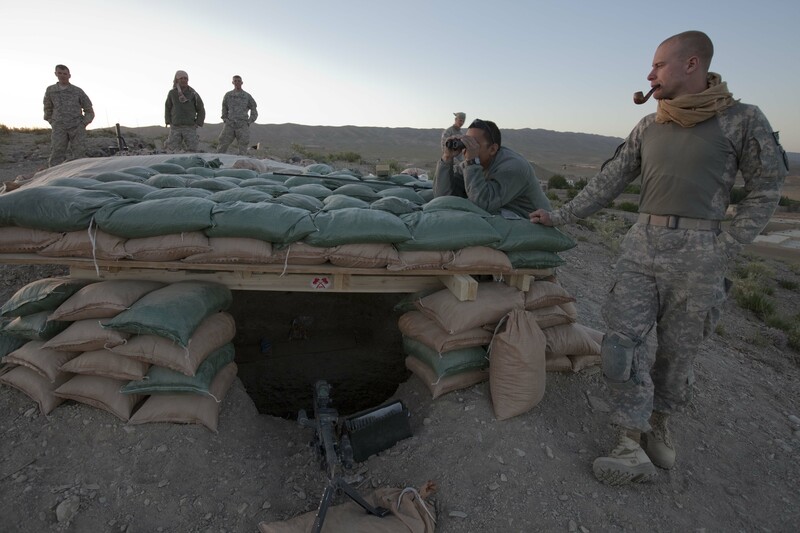 In May 2009, Sean Smith, a photographer and filmmaker from the Guardian, embedded with the U.S. Army in eastern Afghanistan. Ken Wolfe, command sergeant major of the First Battalion of the 501st Infantry, told Sarah that he dropped Smith off at OP Mest and then continued south to a command center in Kushamond. A while later, Wolfe’s first sergeant pulled Smith’s photos up on the Guardian’s website. Wolfe says that when he saw the photos he lost his mind. For their part, the soldiers say it was hot as hell there, and they had a lot of digging to do. There was a little bunker on top of the hill at OP Mest, which served as an overwatch position—a lookout onto the town and crossroads below. But the bunker was small, so they had to dig to expand it to fit more soldiers. They were worried about getting heatstroke in their full uniform—long sleeves, pants tucked into boots, helmets, gear. The squad leader, Greg Leatherman, said he’d asked for permission to remove some gear while they were digging, and had gotten the OK. It's not entirely clear how long or how often the soldiers were out of uniform. But at one point, Lt. Col. Clint Baker, the battalion commander, drove by the OP and caught them out of their proper gear. He reamed them out on the spot. They caught it again when the Guardian photos were published, this time from Wolfe. He told Sarah, “Did I raise my voice? Of course, yes. But it was very pointed, and it was a lecture.” Leatherman was eventually demoted, and two other sergeants were disciplined. Some of the soldiers thought the yelling and the punishments were unfair. But for Bergdahl, it was the last straw. He thought the leadership's reaction—particularly Lt. Col. Baker's reaction—was beyond unfair. He thought it was irrational and dangerous. And he began to fear that, worst-case scenario, the battalion leadership might put the platoon in harm’s way, on purpose. He felt he had to do something to bring attention to this threat, he says. So he came up with a plan, to run from OP Mest to FOB Sharana. To initiate a DUSTWUN. For more from Smith’s embed, take a look at this video. You can also read more here.